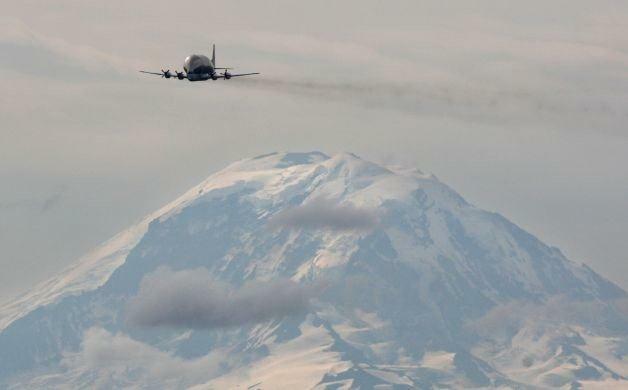 For the third time in just over a month and potentially the last time ever, NASA’s Super Guppy could be spotted high above the Seattle skyline as it delivered the final portion of the Space Shuttle Trainer to Seattle’s Museum of Flight on Thursday morning. Following a low fly-over that buzzed the heads of hundreds of spectators, NASAâ€™s Super Guppy landed at Boeing Field at 10 a.m. with the forward portion of the payload bay on board. It taxied past The Museum of Flight to Boeing’s Military Flight Center, where the payload bay was moved from the Super Guppy onto an Air Force Tunner 60K loader and slowly transported across East Marginal Way to the Museum’s Charles Simonyi Space Gallery. This could be the Super Guppy’s final flight to the region as many experts believe the plane will be retired within the next several years. Built in the 1970s, the Shuttle Trainer is the only one of its kind in the world and is the simulator in which each of the 335 space shuttle astronauts trained. It will be on display in the 15,500-square foot Charles Simonyi Space Gallery, where it joins a collection of other rare space artifacts including Simonyi’s Soyuz TMA-14 spacecraft and interactive exhibits showcasing space travel from the earliest days of the space shuttle program to the future of commercial space flight. The payload bay portion of the shuttle trainer is 61 feet long, 19 feet wide and 23.5 feet high.